This week I received an email from MetaCarta in which they announce the end of their generous conditions for using their web services as well as some major technology changes. We are improving the capabilities of MetaCarta's powerful Geographic Search & Referencing Platform (GSRP). Over the next 30 days we'll be transitioning to a new system for MetaCarta Web Services. After this transition is complete you will no longer be able to access the current OnDemand service. If you would like to sign-up for a free 30 day trial account to try our new Web Service you can do so at our developers page. Sad news as this surely means the 'beginning of the end' of the free usage of MetaCarta's geoparser tool which I used for Geoblogosphere News to identify placenames and locations mentioned in blog posts. Fortunately, Yahoo! has released their Placemaker geoparsing Web service last autumn, so there is an alternative! In a recent paper in Nature Fucheng Zhang and co-workers report on their work on fossil melanosomes of Cretaceous dinosaurs and birds. The examination of fossil melanosomes gives important clues to the colour of feathers or skin of these creatures. 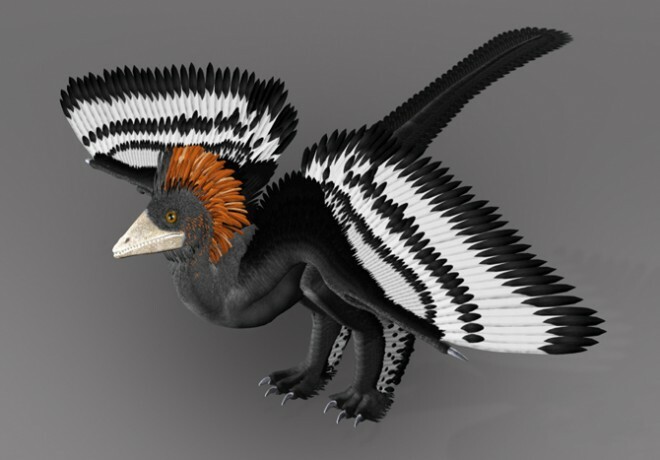 The expressive colour patters of early feathers Cretaceous dinosaurs and birds adds to the discussion whether feathers evolved first for flying, or whether they served other purposes, i.e. signalling to potential mates or rivals. Zhang, Fucheng, Stuart L. Kearns, et al. (2010), Fossilized melanosomes and the colour of Cretaceous dinosaurs and birds, Nature, online, doi:10.1038/nature08740. Recent advances in computer technology allowed remarkably realistic animations of dinosaurs (and other creatures) in films. But how realistic are these animations? In a memorable scene from Steven Spielberg’s Jurassic Park, a Tyrannosaurus rex gallops behind a jeep, close to overtaking it, lunging to take a bite out of Jeff Goldblum — to the horrorified delight of millions of thrill-seeking movie-goers. Assuming dinosaurs could be resurrected, how realistic would this situation be? Not very, according to Karl Bates, a researcher in dinosaur locomotion. In fact, our scrawny-armed, prehistoric friend would probably have trouble outrunning a bicyclist. Depending on how fast you run, you may or may not be in trouble if you were on foot. By his best guess, this dinosaur ran at about an average running speed of 15 miles per hour (24.5 kph) and would have walked at about 5.5 mph (9 kph), faster than the average humans — but not the fastest ones. It turns out that muscle size is the single most important determinant for dinosaur speed. Since we know little about their actual muscle mass, there is a lot of guess work involved. But with these new high-performance models it is an educated guess. The model allows to study different scenarios in a physical environment, including gravity. Looking at modern vertebrates, their number of vertebrae varies remarkably. While some snakes have of the order of 300 vertebrae (all thoracic vertebrae), some turtles only have 18 vertebrae in total - from neck to tail. Then, in mammals the number of vertebrae and their functional division is remarkably constant. In a recent study Johannes Müller (Berlin Natural History Museum) and co-workers surveyed 436 recent and extant amniote taxa to study the development of vertebrae in response to environmental pressure, body mass and genetic factors. Early mammals (synapsids) had six cervical vertebrae and in total twenty thoracic plus lumbar vertebrae. The number of vertebrae is determined by somite formation and Hox-gene expression during embrional development. This also determines the position of the limbs along the spinal column. Early synapsids already showed the same number of vertebrae as recent mammals, while basal reptiles already showed a great variation in their number of vertebrae. The paper comes with substantial amounts of supporting information. Unfortunately, the direct link from the article "splash page" does not work. This, again, shows the importance of using persistent identifiers like DOI for the publication of supplementary data.